Leominster station was once described as the grand junction of the Marches. It once comprised four platforms, two on the main north and west line and two that served the branch line trains that ran eastwards to Bromyard and Worcester and westwards to Kington. There were once extensive goods sidings on both side of the main line as well as a small engine shed and turntable to the north of the station. The main Shrewsbury and Hereford Railway was sanctioned by Parliament in 1846 and was opened through to Hereford Barrs Court station in 1853 with a new station at Leominster. In 1863, after much wrangling, the Great Western Railway (GWR) and the London & North Western Railway (LNWR) became joint owners of the line which was managed by a joint committee. The Leominster & Kington Railway was sanctioned by Parliament in 1854 and by October 1855 had opened as far as Pembridge. The line was completed to Kington in 1857 and in 1862 was leased to the West Midlands Railway which soon after passed into GWR hands. Further branches were opened to New Radnor as featured on the timetable below and also from Titley Junction to Presteign. The branch line was closed to passengers in 1855 although occasional goods traffic to Kington lasted until 1964. Interestingly the Kington branch was often worked by locomotives from Worcester, the small shed at Leominster being a sub depot of Worcester. A Worcester – Bromyard –Leominster railway was sanctioned by Parliament in 1861. However, the failure of various contractors and a lack of finance delayed construction and eventually only the section from Worcester to Bromyard was completed. The abandonment of the section through to Leominster was approved in 1869. In 1874 an unconnected company obtained an act to complete the line. This was completed to Steens Bridge in 1880 and through to Bromyard in 1884. By 1888 the whole line had become vested in the GWR. The Leominster line was closed in 1952 and the whole line through to Bransford Junction on the Hereford – Worcester main line in 1964. 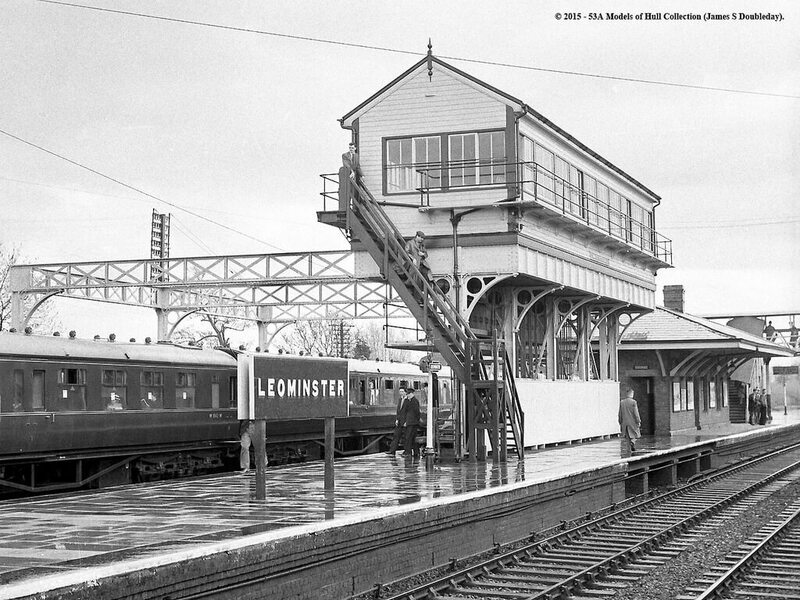 Leominster station became a very busy junction controlled by three signal boxes. These were Leominster south where the Bromyard line diverged, Leominster Station signal box and Kington Junction signal box where the Kington line converged. This signal box also controlled the busy level crossing for the main A49 road. Leominster Station signal box was a very grand but also rather precarious affair as can be seen from the accompanying photograph. One wonders if the thing rather shook on its lender pillars when a heavy north to west route express went thundering through! Today Leominster station is a shadow of its former self-being served by the Cardiff – Manchester train service. The only remaining signal box is at Leominster south. The original 1853 low two-storey building is still a part of the operational station. In brick with stone dressings and a hipped roof, its mullioned windows with sidelong glazing bars make it an interesting building as part of Leominster’s history. The building is sub-let and a welcome refreshment café named ‘Cuplings’ has recently opened.